1. Dimmable. 6 lighting colors, and 7 illumination options, which allows adjustment for best comfort and use. 2. Protect eyes. Natural and Non-flickering light. 3. Power saving. small loss, high conversion rate, eco-friendly. 4. Smart Touch. Control color and brightness by touching induction loop. Smart Touch Sensitive Control: Touching induction loop for lamp switch on or off and changing light colors. 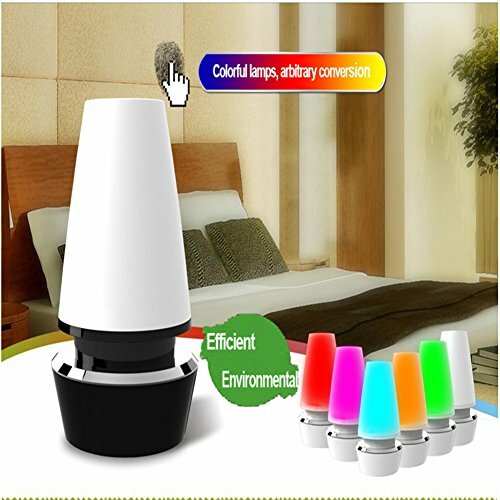 6 colors light, 7 lighting effects options, each time you touch, you can have different lighting effects you like. With imported high brightness Led light, it's more high-efficient, no strobe, energy-saving, environmental-friendlly and eye-care Built-in 720mah rechargeable lithium battery, using continuously for 7-10 hours by USB charging 6 hours. It's widely used in living roon, bedroom and study. A Must Have for power outage, it's also the perfect partner for camping or hiking.